KUALA LUMPUR: Datin Seri Rosmah Mansor is to apply to suspend the proceedings of a lawsuit filed against her by a Lebanese jewellery firm seeking the return of 44 pieces of jewellery it has claimed to have sent to her. Lawyer Datuk G. David, who is acting on behalf of Lebanese firm Global Royalty Trading SAL, said the court had also ordered the government to file a statement of defence as the second defendant in the suit, and that the trial had been set for March 4 and 5. On Aug 20, 2018, the High Court allowed the government’s application to be an intervenor in the suit and was named the second defendant. 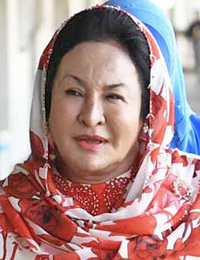 The company, which supplies jewellery to royalty as well as renowned clients from around the world, claimed that unselected jewellery would usually be returned, and, in certain circumstances, Rosmah would borrow the jewellery and return it to the plaintiff later. Global Royalty claimed that on Feb 10, 2018, it had sent 44 jewellery items including diamond necklaces, earrings, rings, bracelets and tiaras, each worth between US$124,000 and US$925,000 to the defendant, hand-delivered via two of its agents.